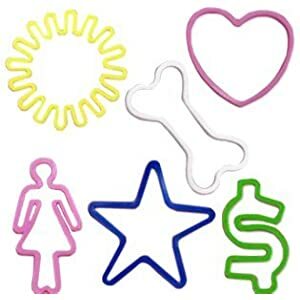 mommy bytes: Silly Bandz Fever! Several months ago, Dova and I were in a store where she stopped dead in front of a display of Silly Bandz. I had no idea what they were and immediately said no. Shortly after that, she started coming back from school with a variety of Silly Bandz on her wrists. She had won them from the prize jar from school for good behavior. 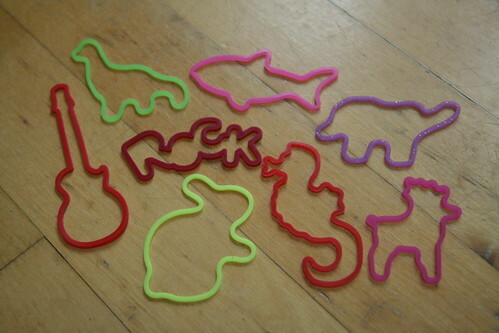 Every day she came back with a different set of Silly Bandz that she had traded with her friends. Here is a sample from that day. They've all changed since! 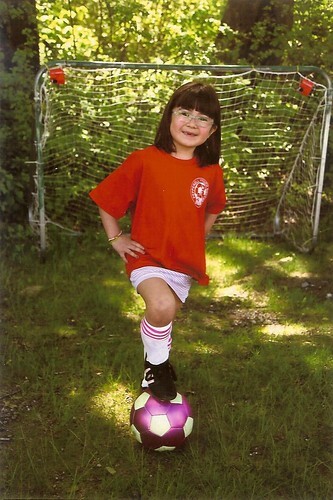 I didn't catch the fact that she wore them for her soccer portrait. to shoot at each other; wearing excessive amounts that interfere with writing/school work; taking them off to count or play with; finding/losing them;…and other examples that distract our children. Teachers are dealing with these problems according to their different grade levels; however it is clear that there have been problems in some classrooms. Please speak to your child if you feel that this might be a problem. Thank you for your cooperation. I had no idea what an obsession this has become with the Kindergarten set! Lately she has been begging us to buy more Silly Bandz. Yesterday, I went to our local Rite Aid and asked whether they carried them. They did, but they were out and was receiving a shipment today. When we went again today at 7pm, they were sold out again. Dova was crushed. So much so that she holed herself into her room crying. Such begins the first of many fads in her life. Lets hope that they are all this cheap! Oh my goodness, yes! In fact it's just in the past several days that these have hit the big time in our school. Abby and Hannah each brought one home last Thursday that they'd been given and it's been all about those silly plastic things ever since. WalMart has packs of 12 'Googly Bands' (same exact thing) for $1, by the way... ;) I asked Hannah today if these things are driving her teacher crazy yet and she said, 'oh yes!'. Guess it's good there's only 4 days of school left, lol. I have no idea about these fashionable stuffs for a little girl like Dova, cute! I am unbelievably proud to say that this is the first fashion trend in the entire history of the world that started in no other than...Birmingham, Alabama. Even the New York Times reported that it started here, and it just makes me so happy. What amazes me about these things is that they're popular with kids Ali's age (3) all the way up to high schoolers. Pretty amazing stuff. We had the craze last summer and fall, but now that the market here is over-inundated with them (we even had an entire store just for silly bandz at Christmas), they're not as cool anymore. So the moral of this story is, you and I need to get a mark-up business going on. I go to the mall kiosk overflowing with every variety, buy them all up, mail them to you, then you sell them with a 50% mark-up. We'd be millionaires.